The TINYpulse Chrome plugin enables you to send Cheers for Peers, suggestions, and even respond to your current Engage survey directly from your Google Chrome browser without having to search your inbox for your survey email. This handy tool provides you with ultimate convenience, making it a breeze to give feedback and send Cheers in a matter of seconds. Make sure your Chrome browser is completely up to date. Chrome typically updates automatically, but if you're not sure, find the settings bar in the top right corner and check to see if your Chrome prompts you to download an update. If you don't see an option to update, then you're good to go! Search the Chrome web store for the TINYpulse plug-in. You can find the Chrome web store by googling "Chrome web store". Once you're there, type in TINYpulse into the search bar to get rockin' and rollin'. Accept the confirmation message by selecting Add extension. Wait until the app has finished installing and you'll get a confirmation once it's finished. You'll now see the TINYpulse icon in the top right corner of your browser. Click that TINYpulse Lotus button to enter your TINYpulse associated email address. 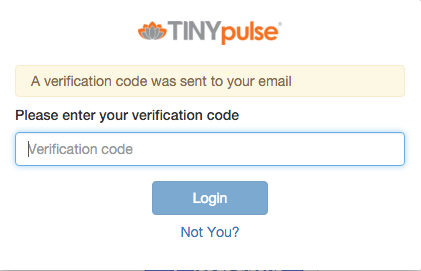 After you've entered your email address, you'll be prompted to enter your password or you'll be sent a verification code to your inbox if you haven't set your TINYpulse password yet. After either entering your password or your verification code, you'll be given access to all of the plugin's fantastic features. You will have the option to send Cheers and suggestions, as well as respond to your current Engage survey.